Your book made our trip so much fun - looking for hidden Mickey's, knowing little known facts & taking pictures outside Club 33 & some of the other fun places. The history you have in the book makes you feel a little bit special as you hunt down the places mentioned & share the knowledge with others. We were at Disneyland with a good friend who knows many little details about Disney & she read your book while we were there. The fact that she walked away saying she was ordering one immediately was pretty huge as I thought she knew everything! She was so excited to be getting even more! "I bought a copy of this book for my next trip to Disneyland. My father found it on my book shelf and decided to read it from cover to cover. He isn?t a big fan of the Disney parks because they are too crowded and hasn?t been since sometime in the 80?s. Well, after reading all the Fun Facts, trivia, hidden Mickeys and the history of the park he is excited to finally go back." "I received both books and gave one to my daughter. We both LOVE the book! Well done and fun to read!" This book is amazing. 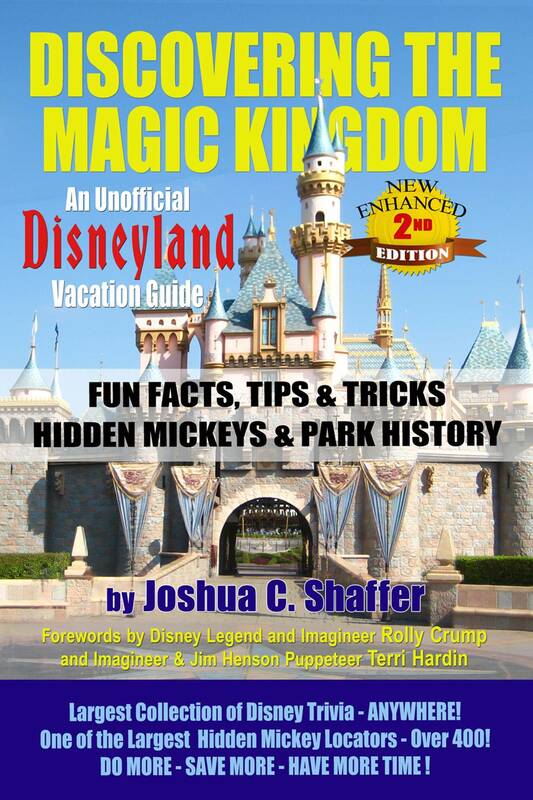 It has everything you would ever want to know about Disneyland and more. We used it on our last trip and found that even waiting in lines was more fun not to mention that the helpful hints were able to save us money. I would recommend this book to anyone going to Disneyland for the first time or the hundreth time. Cindy "Super Satisfied Disney Fan"
This is very thorough, well researched book on Disneyland. As Ed MacMahon would say to Johnny Carson, "Everything you ever wanted to know about Disneyland is in this book." If you love Disneyland, you will love this book. Well done! We got your book before we left for Disneyland/CA Adventure. It was helpful to know how to manuever through the parks and see the most we could in two days. The 'Fun Facts' kept us distracted while standing in line. Others around us asked how we knew so much about the rides. My son just held up the book. We found a grocery store by our hotel as well as a restaurant. Thanks for all the tips.